I don't know that Into Thin Air actually changed my mind about anything in particular, but it was certainly eye-opening. There were quite a few things I never realized about climbing Mount Everest until reading this book. First, the pricetag. The cost of a guided trek to the summit of Everest averages $65,000, and there are people who give it multiple tries. Holy cow! I think the high pricetag makes people even more determined to get their money's worth and push for the summit, even when circumstances become a matter of life and death and continuing may not be the most rational decision. Second, the use of oxygen. I never realized that the majority of those making the climb on Everest do so with the assistance of supplemental oxygen. If the oxygen tank runs out and you're only halfway down the mountain, you're in serious trouble. Third, the reliance on Sherpas. I always thought Sherpas were simply guides. Little did I know that they are the workhorses of the mountain. They are the ones who actually go ahead and prepare the path with climbing ropes. They often carry the enormously heavy packs of the climbers. At times, they literally drag a climber up and down the mountain. Without Sherpas and supplemental oxygen, only a fraction of climbers who attempt to climb Everest would actually summit. Fourth, the pollution. From photographs, Mount Everest look like a pristine, majestic mountaintop. But the reality is that the side of Everest looks more like a garbage dump. Trash from climbers and empty oxygen tanks litter the mountain face. Fifth, the bodies. If you die while attempting to summit Everest, most likely your body will remain on the mountain. Future climbers will hike right past your dead body on their way to the summit. This boggles my mind. 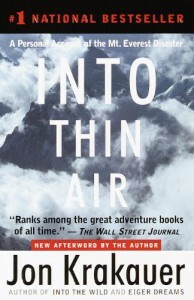 So after reading Into Thin Air, I realized that climbing Mount Everest is very different than I imagined. It's still an impressive feat, but it can also be an ugly business.